Dr. Jonathon Leipsic uses 3D models of patients' arteries to assess blood flow. St. Paul’s Cardiac CT Laboratory is the first clinic of its kind in Canada to use non-invasive, computer generated 3D imaging to precisely measure coronary arteries and blood flow in heart disease patients. Using a web-based technology called HeartFlow Fractional Flow Reserve-Computed Tomography (FFRct), St. Paul’s physicians are now equipped to vastly improve the way patient care is managed for many British Columbians suffering with heart problems. 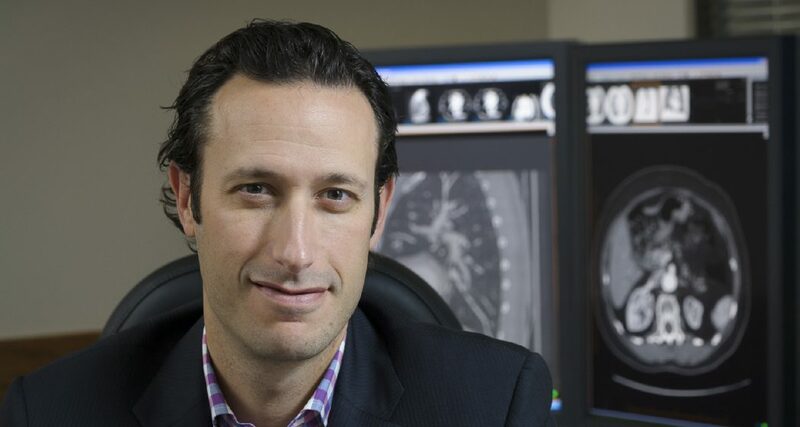 “We are the first centre to have FFRct in clinical use in Canada and it’s been really disruptive to how we practice and how we’ve been able to help patients with suspected coronary artery disease,” says Dr. Jonathon Leipsic, chairman of the Department of Radiology at St. Paul’s Hospital. Traditional diagnostic tests, while non-invasive, provide little information on potentially worrisome symptoms like chest pain, leading many patients to endure the stress and discomfort of unnecessary invasive testing. FFRct analysis effectively separates patients who need further in-depth testing from those who don’t, which in turn reduces health care system costs and wait times. The state-of-the-art analysis is carried out by HeartFlow Inc., which receives data from coronary CT scans and employs highly advanced computation to assess the impact that blockages have on blood flow. The result is a 3D model of the patient’s arteries sent back to clinicians who then use it to determine, vessel by vessel, if sufficient blood is reaching the heart. The groundbreaking St. Paul’s Cardiac CT Laboratory is recognized as the most academically productive department of its kind in the country. Dr. Leipsic anticipates treating 500 patients this year with FFRct analysis. For them, the new technology will be an invaluable tool to recovering their health, and none of it would be possible without St. Paul’s Foundation and donor funding. To learn more about the groundbreaking work of our radiology team, visit helpstpauls.com. Dr. Jonathon Leipsic has received an unrestricted research grant from HeartFlow Inc. and currently serves as a consultant.